It all started with the American Dream. Following World War II, the Marshall plan helped rebuild Europe and Japan: economies were growing and populations healing. Demand for US goods was strong. But as the reconstruction boom faded, the US found itself with slowing growth, rising unemployment and a generation of baby boomers asking for social change. Then came the Vietnam war. By 1971, inflation had reached over 5.8%. The response was the Nixon shock, a series of economic measures, including the exit from the Bretton Woods system of exchange rates. By 1973, the Bretton Woods system had been substituted by free-floating fiat currencies . But this wasn’t only the start of a system of free-floating exchange rates – it was also the beginning of a cycle of fiat credit and of what Raghuram Rajan called “let them eat credit” policies. Together with currency depreciation, the US initiated a series of measures to expand access to credit and boost lending. The aim was to allow middle-class American families to afford a house, education and a better lifestyle. Fannie Mae was privatized (1968) and Freddie Mac created (1970) to buy and pool mortgages issued by banks, thereby reducing housing financing costs. Sallie Mae (1973) was established to originate and service student loans. More credit policies followed over the coming years, in tandem with the gradual deregulation of financial markets, up to the repeal of Glass-Steagall (1999). 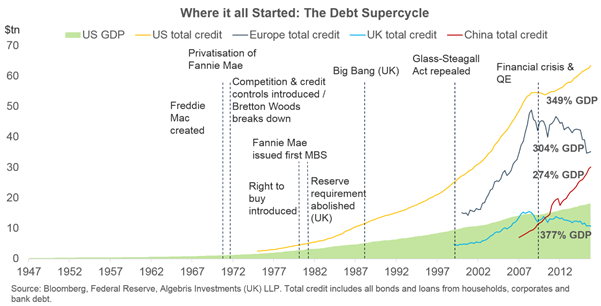 The debt supercycle was born: between the 1960s and up to the 2008 crisis, total private debt outgrew GDP by four. Other countries mirrored the same subsidies and financial deregulation measures that supported credit growth in the US. The United Kingdom abolished bank reserve requirements in 1981, and in 1986 the City of London launched its Big Bang expansion plan. Others followed, and private debt caught up with US levels in Europe and most recently in China, where a government-led stimulus plan has doubled credit since 2008. Let them eat credit policies remain popular today. Some examples include the UK’s Help-to-Buy programme, which allows people to buy a house up to a value of £600,000 with a 5% down-payment, and Brazil’s Minha Casa Minha Vida . As Rajan said, it is easier for politicians to keep their constituents happy by enabling middle-class households to afford a new car, or an exotic holiday, rather than focusing on reforms to improve long-term growth. How can the world cope with this growing amount of debt? Monetary policy has accompanied the debt super-cycle by lowering the cost of refinancing. 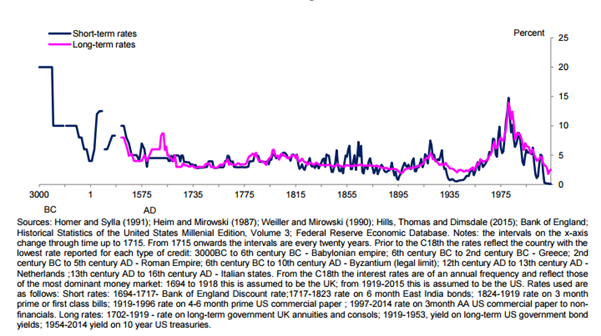 Today, both nominal and real interest rates are at multi-century lows. But while lower interest rates were previously spurring credit, consumer demand and growth, today, the impact of interest rates on demand and growth is as flimsy as it’s ever been. Put differently, as both corporates, households, banks and governments remain overburdened by the existing stock of debt, the engine of credit creation is still broken. This means that even if central banks create money by buying assets, the expansion in M2 or M3 aggregates and the reduction in bond funding costs doesn’t translate into government and corporate spending or investing. And without investment you have no job creation and no inflation. Fixed investment is down in the Eurozone by nearly 12% since the crisis, according to Eurostat data . Despite the European Central Bank’s efforts to reduce corporate and bank borrowing costs with its new CSPP and TLTRO programmes , corporate investment and bank lending have failed to recover. The result is what has been called secular stagnation, new normal, ugly deleveraging, balance sheet recession and Japanification . I call it “QE infinity”: a prolonged period of low growth and low interest rates, where policy-makers persist in implementing policies that won’t fix the problem. They won’t ever say they’re out of ammunition, but central bankers are starting to look like naked emperors. “Is monetary policy by itself going to create growth, employment? You seem to give a lot of responsibilities to the European Central Bank. Can monetary policy create growth by itself? The answer is no. Monetary policy can create the economic conditions for growth,” ECB President Mario Draghi told the European Parliament last year. Put differently, there is only so much monetary policy can do to re-start growth: it is an anaesthetic, not a cure. If the good news is that monetary policy and QE can buy time, kicking the can comes at a cost. Using monetary anaesthesia for a long time can eventually cause the patient to develop side effects. Among these are distortions in asset markets, rising wealth inequality and a misallocation of resources. Distortions in asset prices and potential asset bubbles are a direct consequence of asset purchases. Bond investors, for example, are left with little risk premium to compensate for credit and liquidity risk – while more investors are herding towards the same trades, as pointed out by the IMF’s herding indicator in a recent Global Financial Stability Report . The second issue with prolonged QE and low interest rates is that it benefits the haves more than the have-nots. There are certainly a lot of factors which have contributed to the rise in wealth and income inequality over the past decades – including globalization and technology, which have polarized incomes. But the mechanical effect of QE on asset prices has arguably exacerbated disparity in wealth across social classes and across generations. Both in the US and Europe, under-35s own only 5% of financial assets. The gains from QE-led asset appreciation are not evenly distributed, and the trickle-down effect through incomes has been negligible: median wages have stagnated over the past 20 years, while corporate profits and top-10% and top-1% wealth have been rising. As pointed out by Standard & Poor’s earlier this year, rising inequality can reduce growth potential over time. Finally, persistently low interest rates can lead to misallocation of resources towards debt-dependent industries, as pointed out in several papers by Claudio Borio of the Bank of International Settlements. Cheap funding has fuelled a build-up of industrial over-capacity in energy, mining, shipping, banking and a range of other sectors. Keeping interest rates low slows a reduction in capacity – delaying the pain but also keeping zombie firms alive. In turn, this makes economies more sensitive to increases in interest rates and reduces central banks’ degrees of freedom. In other words, too low for too long interest rates can become self-validating, bringing low interest rates tomorrow, and reducing productivity as resources remain allocated to the wrong sectors. There are three endgames to the QE infinity debt trap. The good one is a scenario where policy-makers are able to quickly recognize losses in their economy and financial system, and reallocate resources efficiently. Since the 2008 crisis, this has happened in the United States, Ireland and Spain. With national differences, these countries have all reformed and recapitalized their banking systems, isolating the losses and attracting new investment. The second-best scenario is the equivalent of Japan’s lost decades. In Japan, banks kept lending to zombie firms for over 15 years before starting a restructuring. The result has been a prolonged stagnation which persists today, despite the Bank of Japan’s efforts to implement aggressive policy actions. The worst-case scenario is that the combination of low growth and rising inequality may eventually push electorates to opt for extreme solutions. Many populist movements are gaining support around the world, all promising voters a quick exit from current problems – whether by abandoning trade agreements, fighting migration or cutting taxes. These are clearly economic illusions. Britain's recent EU referendum result is a case in point, where an electorate frustrated by growing inequality and economic imbalances has fallen prey to a misguided hope: that leaving the EU would lead to prosperity. The reality is different, as the EU represents the UK's largest trade partner. As one businessman said on the situation: “The UK is the door to Europe. Without Europe, it's just a door.” The best-case scenario is a period of limbo, without a prime minister and without a plan. This will reduce investment, push the pound lower, and hurt the same families who voted to leave. Absent an emergency budget from the Treasury, the result is likely to be – again – interest rates cuts and a restart of QE. There are real solutions to the current environment of QE infinity. The first step should be to combine monetary policy with a stronger fiscal effort aimed at increasing investment in the real economy. This can be implemented through infrastructure spending in the United States and through Europe’s Juncker plan , which so far has fallen short. Another more comprehensive solution in Europe could be the issuance of Eurozone bonds, or as it has been proposed recently, refugee bonds , to cope with the ongoing migrant crisis. That said, increasing fiscal stimulus will not prevent future crises. To get us out of the QE infinity loop, we need to build a more flexible and resilient financial system: one where debt overhangs can be reduced and restructured in case of failure, rather than kicked forward for decades. For banks, policy-makers have already implemented bail-inable debt , which converts into capital when banks have losses, reducing the need for taxpayer bailouts. The same flexibility can be implemented for sovereign debt through GDP-linked bonds , where bondholders get more interest if economies grow and less in case of a recession. This can help countries avoid a recession-austerity spiral like the one that has engulfed Greece since the crisis. For corporations, developing alternatives to bank lending like bonds and securitisations, as well as making equity as tax-efficient as debt, are all ways to enable a quicker restructuring in a crisis. Finally, a rethink of monetary policy is needed to include financial stability at the core of the central bankers’ mission. Macro-prudential measures have so far been the answer to control potential asset bubbles – yet these tools are often untested and remain a side game in the priority list of central banks. This perpetuates the incentive to ease policy to get a credit and growth boost today, while leaving the next generation to deal with the consequences of the financial bust. The current economic recovery is fragile and in its late stages: there is little time left to escape the QE infinity debt trap. Policy-makers need to start working now to build a financial system that serves our economy, or we will be left – again – with an economy that serves its financial system.